Perhaps its the location or the growing number of world-class restaurants in the city, but I've always felt that the Restaurant at Meadowood has been the forgotten son of the Bay Area fine dining scene. Certainly Meadowood has long dwelled in the shadow of its more famous neighbor to the south, The French Laundry. It speaks volumes that Michelin didn't even rate Meadowood when the guide first came to the Bay Area. It wasn't until the next year that Meadowood got on the board with a 2 star rating that was upgraded to 3 in 2011. I visited the restaurant back in 2010 and its been on my list for an encore ever since it netted star number 3. Though full disclosure, I tried to get a table at Atelier Crenn, Benu, Manresa, and Saison before looking towards Meadowood. 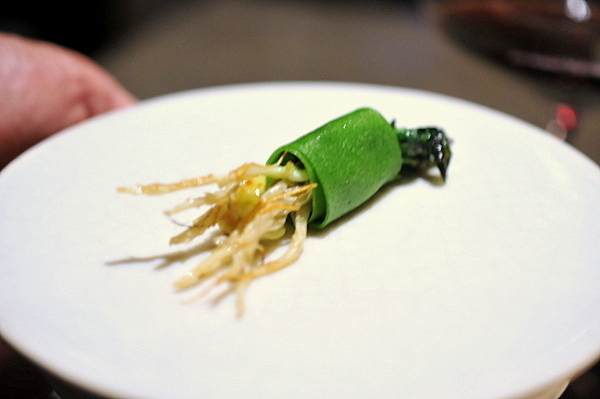 The tasting menu at Meadowood kicks off with a number of small bites. First up was a delicate melange of peas full of crunch and fresh grassy verve. 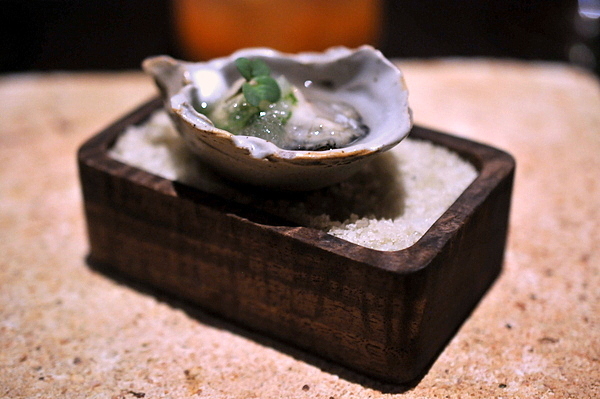 The final snack consisted of a beautifully shaped Miyagi oyster from Marin County topped with mignonette and kohlrabi. The bivalve opens with a fairly assertive salinity followed by a pickled twang and hint of herbaceousness that brings out a melon-y character in the oyster. Moving into the larger courses we started with a vivid yellow daylily broth topped with a melange of radishes and herbs. The broth unsurprisingly has little flavor, instead it is the astringency of the radish that dominates. 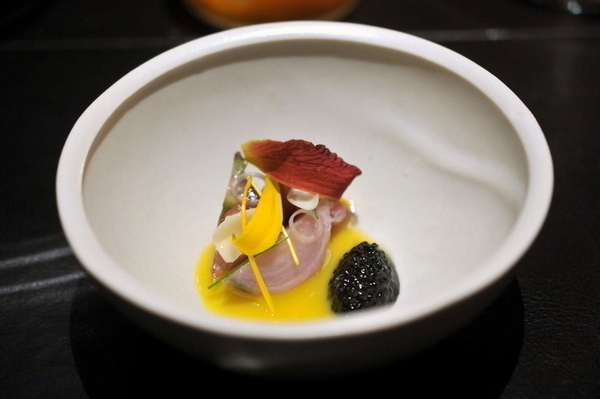 The quinelle of California Sturgeon caviar has a focused salnity on its own, but the rest of the dish rounds out the rough edges and leaves behind a gentle butteriness. The meal took a markedly heavier turn with this immensely satisfying handmade pasta. The pasta itself is perfectly al dente and stuffed with a satisfyingly toothsome spot prawn filling. The prawns also feature prominently in the sauce giving the dish an ethereal salinity and smoky buttery heft tempered by the bitter succulents. 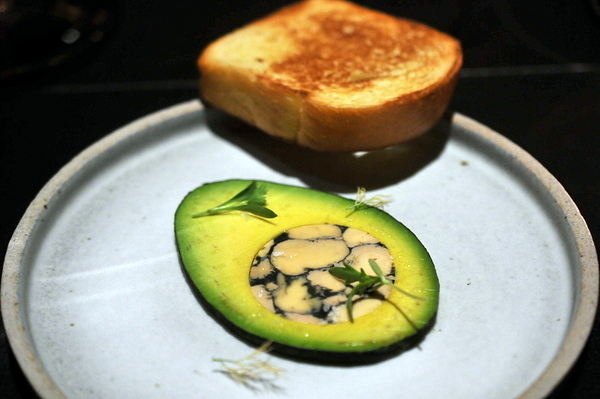 The next course was an ultra-luxe take on avocado toast. 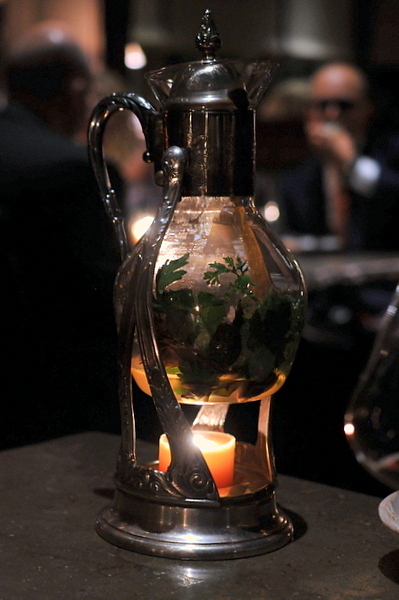 The creamy perfectly-ripened fruit is filled equally creamy foie gras threaded with charred herbs. The herbs are crucial here bringing a smokiness contrast to the richer elements of the dish. The accompanying toast is given equal care and exudes a heady fragrance of fresh bread and butter. If regular avocado toast were really this good I'd definitely be homeless. This was probably the most memorable course of the night. The halibut is cured, dramatically reducing the water content and radically altering the appearance. The halibut takes on a visually striking appearance more akin to a block of pink Himalayan rock salt than a piece of white fish. Biting into the fish is an equally enchanting experience, sumptuously dense texture and an gentle even salinity with subtle undertones of umami. 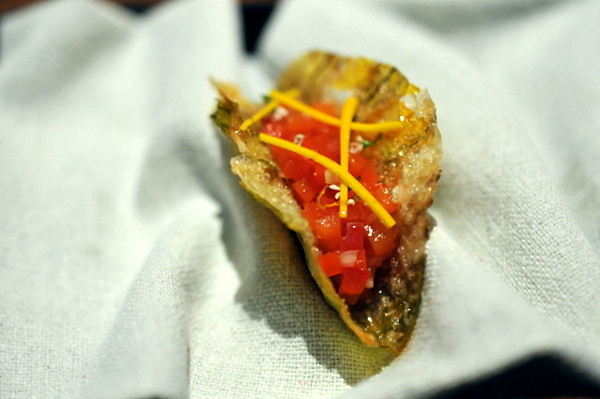 The unripened plum adds a slight preserved funk and sweet-sour twang though personally I liked the fish better without it. 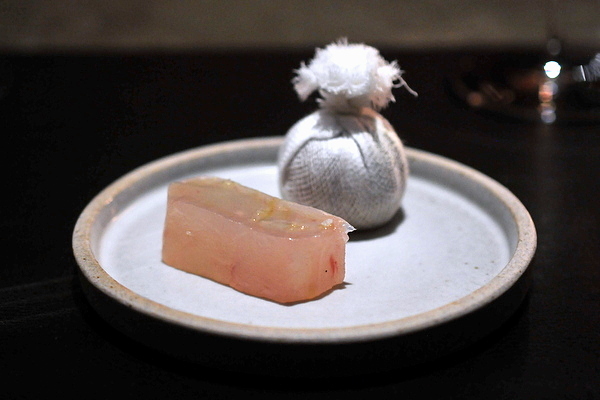 The braised abalone is suffused with loads of briny umami and a delightfully tender texture. 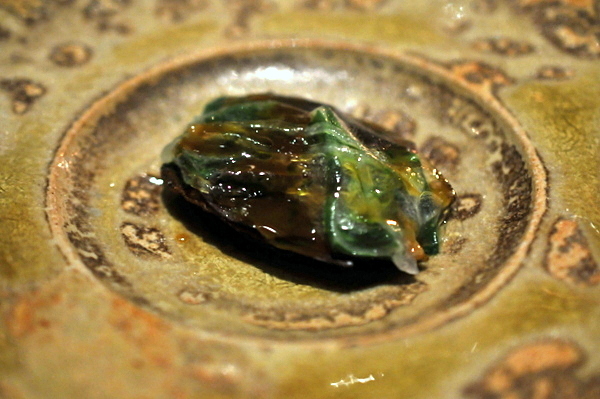 The slice of abalone is topped with a translucent leaf of wilted bitter greens for contrast and a sauce that brings with a little porcine richness with it. Along with a presentation of our squab, we were given a whimsical "squab tea" as a little intermezzo before the meat courses. 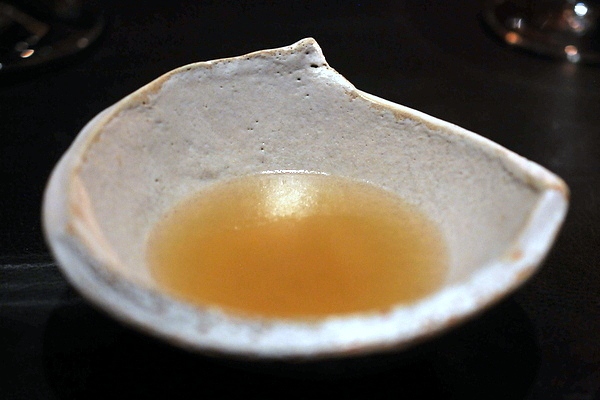 The simple clear broth was reminiscent of a potent chicken consomme. 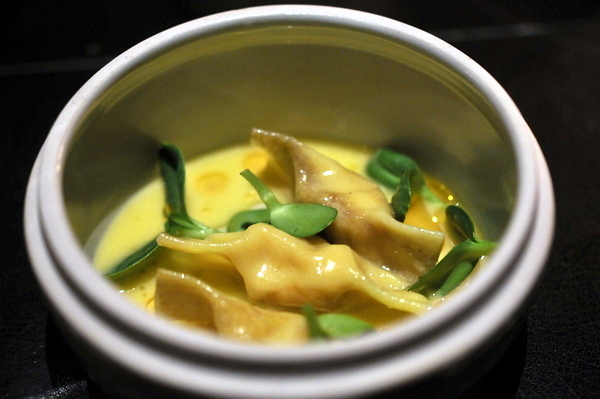 The broth helped wash the flavors of the previous dishes and prime the palate for the courses ahead. The baked squab is finished with a quick sear then spliced and served up with a black cherry glaze and pickled mustard. 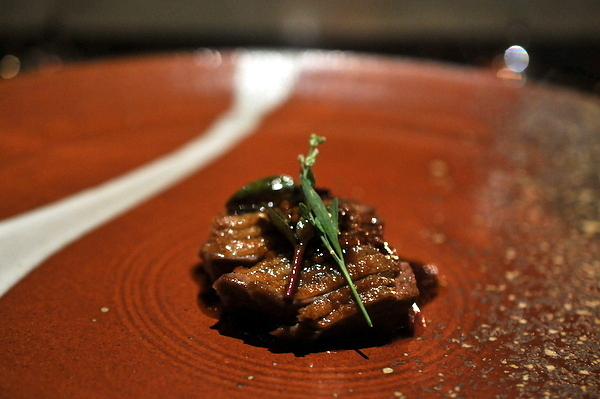 On its own the thin slices of breast are wonderfully tender slivers of smoke and char. The sauce and dressing bring a tight sour brightness and verdant brightness to the powerfully rich bird. The cut of beef came from a Wagyu breed raised in Colorado. 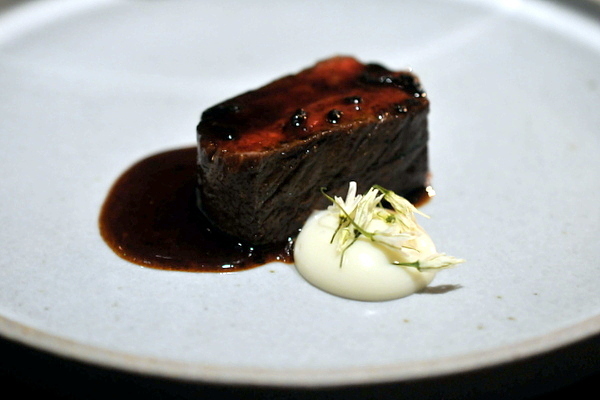 The meat was smoked with onion and garlic and dressed with a sauce of beef fat, black garlic and finished with a pearly dollop of onion soubise. Imbuing the beef with common flavors found in the accompaniments deftly highlights the beef's natural flavor and richness without over complicating matters. Our first dessert was a whimsical play on breakfast using baby pinecones to mimic a bowl of cereal with "milk" and berries. The overall effect was eerily reminiscent of a bowl of Lucky Charms with bright fresh fruit flavors and a simple comforting appeal. 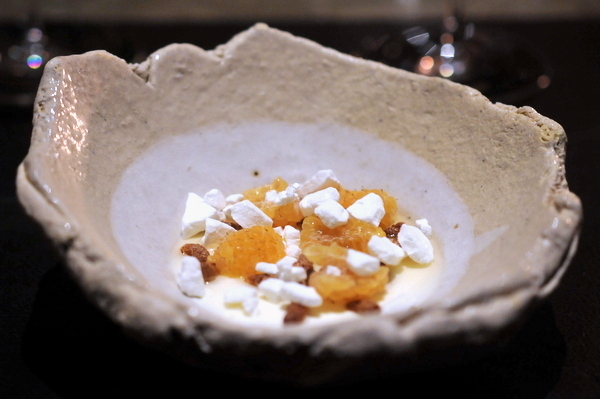 One of the evening's standouts and easily the best dessert I've eaten all year. 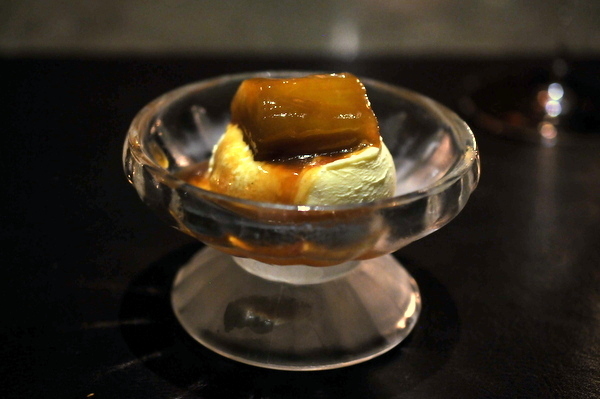 The second dessert was a play on the classic bananas foster with an eggplant marinated in sugar then confited in butter giving the vegetable a texture very reminiscent of cooked bananas and heady salted caramel-esque flavor edged with a vegetal bitterness. A quintet of fruit-based candies ended the evening. 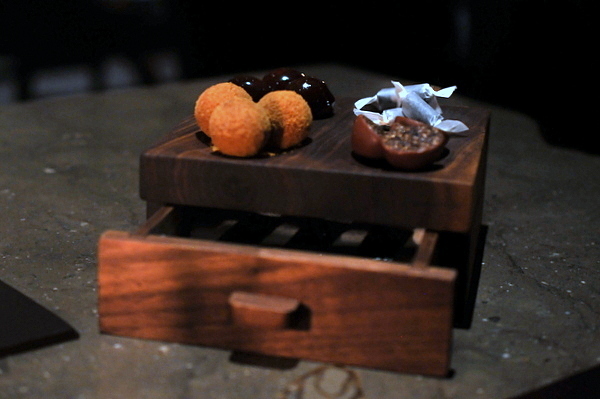 I visited the restaurant back in 2010, but found the experience wanting. The food was polished but felt somehow unsatisfying. This meal has the same level of elegance that I remember but with a bit more soul and creativity; delicately balancing the emphasis on lighter Californian flavors with flashes of lusty deeper flavor.